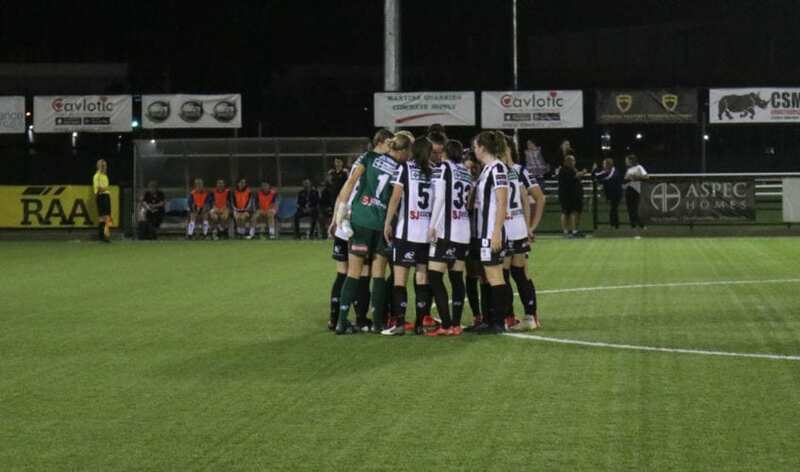 Adelaide City narrowly scraped through with a 3-2 win over a newly-promoted side in Adelaide Comets at VALO Football Centre in Round 3 of the WNPL. It was a challenge for the Black and White to keep the game under control, with plenty of credits to Comets for a very strong performance. The former side had to dig deep to come out on top with goals by Daniela Di Bartolo and Tiarn Powell, to cancel out Comets’ goal by Victoria Mansueto and Abbey Flight’s penalty. Both teams took the first 15 minutes trying to settle into the game, with equal amounts of possession. However, Comets took the lead early on, when Mansueto went up solo against ‘keeper Kendall Jenner and slotted the goal through her legs in the 17th minute. Nerves started to seep into City’s game as they tried to search for the equaliser, turning over multiple unforced errors and panicked passes. They levelled in the 39th minute, after the Comets’ keeper spilled Georgia Campagnale’s low drive free kick and Di Bartolo cleaned up the chance by toeing the goal in at the near post. There were two close chances for City early in the second half, and Comets almost got another goal when a lack of communication between the City’s defence saw a player try to chip Jenner, who was off her line. Powell finally found the back of the net in the 66th minute, when she latched onto a through-pass and rounded the keeper to fire the goal into an empty net. Comets drew level when they were awarded a penalty, after shouts for handball by Isobel Dahlen-Flight in the box. Flight coolly struck the ball past Jenner from the spot and converted. Chelsie Dawber finally made her comeback from injury, and almost made an instant impact just two minutes of being substituted on. Unfortunately, her powerful strike rebounded off the inside of the far post and was cleared away by the Comets’ defence. She made up for it afterwards with a stunning pass that cut right through the defence line, to set Di Bartolo up for the match winner and her second goal of the night – keeping City undefeated three rounds into the season. Head coach Andrew Calderbank commented post-match on the mentality of the players. Adelaide City will face off against Salisbury Inter next Friday at 6:15PM at VALO Football Centre.